Posted on July 23, 2014	by Katy K.
This is the adult fantasy I’ve been hearing the most about this year, and well worth the buzz. 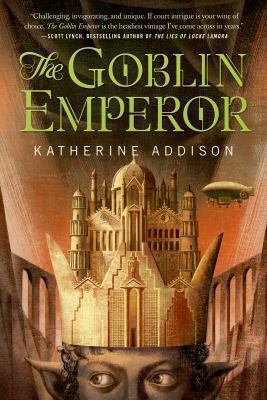 The Goblin Emperor by Katherine Addison. Tor, 2014. In this book, Maia is the despised and exiled fourth son of Varenechibel, Emperor of the elves, by his equally despised third wife, a princess of the goblins. His heritage is clearly visible in his skin, a grey shade in between the white of elves and the black of goblins. Maia’s mother died when he was eight, and his father assigned him an out-of-favor courtier as a guardian, who gave him minimal education. And then the Emperor and his three older sons are all killed in the crash of the airship the Wisdom of Choharo. Maia is now the emperor, and though no one including himself has ever wanted him to be emperor, he knows that he must claim the throne decisively or be killed. He’s thrust into the various factions at court literally overnight, trying to figure out who might be convinced to be on his side, what the various factions are, and needing as well to arrange his own marriage. We are as confused as Maia as he learns that he must have nohecharei assigned to guard him and edocharei to dress him – and this is just the beginning of his new daily routine. The only thing that Maia is certain of going in is that he will not be his father – he is going to at least try using kindness and justice to keep his crown and his head. Addison never makes him unbelievably, flawlessly good, however – he still loses his temper with his servants, and while he’s clearly interested in lessening the discrimination by race, gender, and class that’s prevalent in elven society, he makes no effort to overcome his prejudice against homosexuality. This is such good fantasy! We have the traditional elements of very detailed world-building and culture, given a lovely twist with the goblins portrayed not as evil, but a different people and culture historically at odds with the elves. While political fantasy often turns me off by assuming that I want to spend my reading time writing down lists of character names and their loyalties, Addison keeps things a little simpler by telling the story only from Maia’s point of view. The combination of good characters, world building, plot, and depth make for a book that will appeal to a broad range of fantasy fans. I really, really enjoyed it. This entry was posted in Books and tagged adult fantasy, diversity, high fantasy. Bookmark the permalink. I believe the publisher for Goblin Emperor would only publish it if she used a pseudonym. Why publishers are so ridiculous is anyone’s guess.